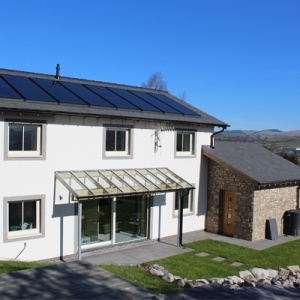 Eco Arc is an award winning chartered architects practice and environmental design consultancy committed to low carbon Passivhaus / Passive House architecture within a holistic ecological framework, based in Cumbria in the UK. As Passivhaus design architects, the standard we generally work to is a successful European ultra-low energy standard for buildings. 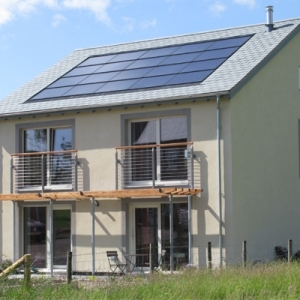 Passive House buildings use only a fraction of the energy for heating of those built to the standards required by current building regulations, and deliver low carbon solutions without needing renewable energy. We have experience of working on a wide range of Passive House projects within the UK including: new build, conversion, rural, urban and regeneration work ranging from housing, commercial, leisure and health buildings within the private, public and voluntary sectors. The short video below shows how the Eco Arc project team erected the structural timber frame of a 4 bedroom Passivhaus / Passive House in one 8 hour day. This included putting up all the 300mm deep I beam pre insulated cellulose external walls, intermediate floor and roof to create a wind and watertight shell in one day. A further two days where required to install all the triple glazed windows and doors and install the required air tightness tapes. 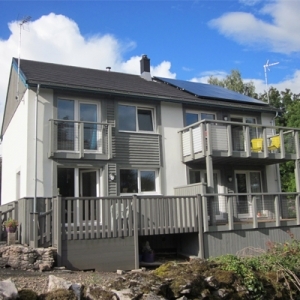 This fine-tuned prototype build system is now a tried and tested method, employed by Eco Arc Architects, Eden Insulation and Ecological Building Systems is to deliver the exacting Passivhaus / Passive House Standards of Quality Assurance. 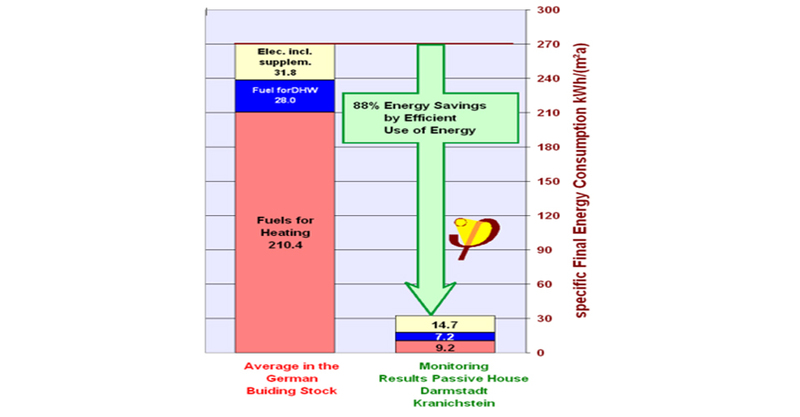 The diagram above shows the results of monitored energy consumption in Germany where Passivhaus originated. Energy consumption of average UK stock is very similar to the German figure. The outcome from monitored past performance indicates that the average energy saving of a passive house is an average 88%. These factors combine to deliver a heating demand that can be met with a minimal heating system. 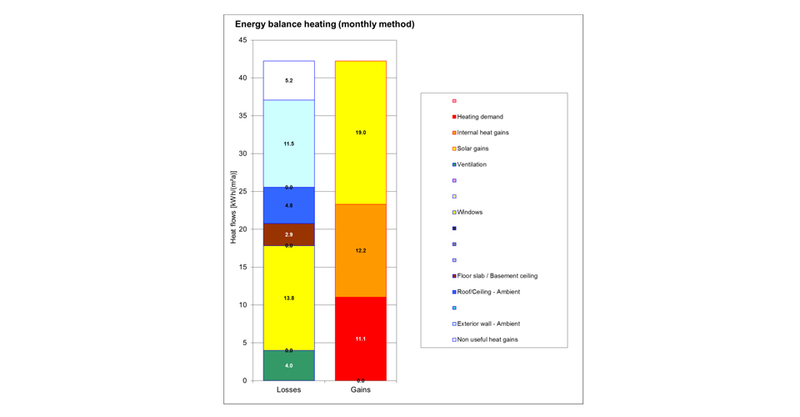 For many Eco Arc Passivhaus homes the heating system consists of a single radiator in the living space and a towel rail in the bathroom, with a total heat output below 1kW for the whole house. The Passive House heating demand must be the same whatever fuel is used; this recognises that renewable energy is in practice in limited supply and ensures the houses are cheap to heat whatever the fuel source. 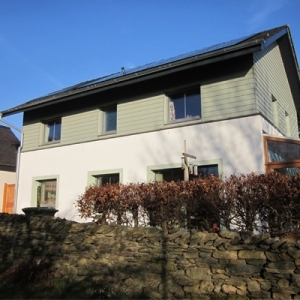 As well as very low heating bills, Passivhaus offers comfort and a healthy indoor environment. Attention to detail in design and construction ensures no draughts or cold spots wherever you are in the house. Heat recovery ventilation uses low power fans to provide ample fresh air day and night, warmed to room temperature by a heat exchanger transferring the heat from the exhaust air from kitchen and bathrooms. Passivhaus is a rigorous energy standard; energy performance must be demonstrated through the use of the Passivhaus energy modelling software, (PHPP), which is specifically designed to model ultra-low energy buildings. This is backed up by air leakage tests on every building and commissioning records of the heat recovery ventilation. The standard requires a predicted heating demand no greater than 15kWh/m² per annum over the usable floor area, and for the local climate. On average the existing UK housing stock uses around 200kWh/m² per annum whilst new-build housing ranges from 50-100 kWh/m² per annum. Generally working with Alan Clarke we develop the design of the project using PHPP from the outset which usually directs the design towards an efficient form, ideally with an open southern aspect. This form minimises the heat loss from the individual building and enables it to receive its share of winter sunshine. The design development and analysis at the planning design will confirm the Passivhaus standard can be achieved. The insulation levels needed to do this can be met with cellulose insulated timber frame, externally insulated single skin blockwork or traditional cavity wall construction, and combined with triple glazed windows and good airtightness. An airtightness standard of 0.6 ach @ 50Pa is a minimum requirement of Passivhaus. The reasons are to ensure draught-free comfort, protect the building fabric from condensation (by preventing leakage of humid air through cracks into the construction), and to ensure that the efficiency of the heat recovery ventilation isn’t bypassed by leakage ventilation. Although this is less than a tenth of the requirement for new UK dwellings the Eco Arc design team are familiar with the design requirements of the standard and have already achieved airtightness test results ranging from 0.11 to 0.3 ach @ 50Pa ach in new-build projects. Where Passivhaus differs from UK building regulations and the old Code for Sustainable Homes / BREAM is the requirement for a maximum permitted level of energy consumption instead of improvement over a more basic specification. So if the building form factor is less than ideal or in situations where over shading is an issue we will upgrade the specification to thicker or lower conductivity insulation levels to ensure the project meets the standard. The heating requirements of each project vary, but are often too low to need a conventional sized boiler. On a couple of projects we used a heater element in the MVHR ducts to pre-warm the incoming air to avoid the use of a boiler altogether. On individual smaller projects we have used an Air Source Heat Pump to provide heating and hot water linked to a PV array with an I Boost switch to transfer sun energy to hot water. We have also used a small gas boiler which is cost effective and has a low carbon foot print due to the low load demand. We have also used a wood stove supplied from on site woodland logs as the primary heat source. Each individual project is assessed for the best fit relative to the site and client preferences. 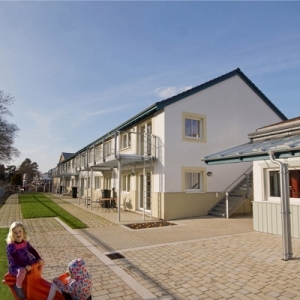 On larger multiple house projects like Lancaster Cohousing project with 41 certified passive houses we used district heating system which also heats domestic hot water. The primary heat source was a wood chip boiler, combined with solar thermal panels. This offers economies of scale in that only one pump and control system is needed for the solar panels rather than 30. Heat losses from district heating pipework can be surprisingly significant for what is widely considered to be an energy efficient approach. This is particularly the case when compared to the energy demand of a home built to Passivhaus standard. We use the best pre-insulated pipework we can source. Significant effort is put into assessing diversity of demand, as this allows smaller pipe sizes to be specified, again reducing heat loss and costs. The wood chip supply contract specifies chip from local woodlands, reflecting sustainability concerns. 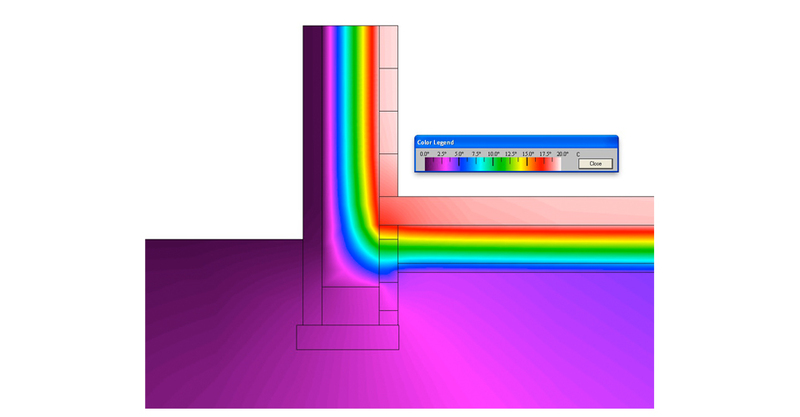 “One of the requirements of Passivhaus design is “thermal bridge free” details. The heat loss through poorly designed junctions can exceed that through the actual floor, roof and walls when they are insulated to Passivhaus levels. 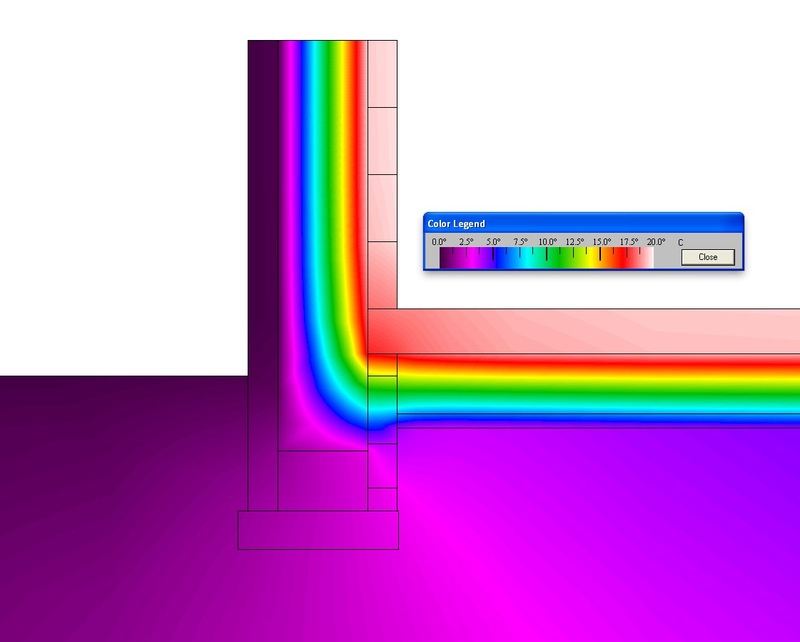 The below diagram is a typical wall/floor junction. The problem we have is the internal leaf of the blockwork wall cutting through the thick layer of insulation that runs under the slab and up the cavity. Ideally the insulation forms a continuous blanket around the building, but at this point we do have to hold the houses up as well. The solution illustrated in the diagram below is the use of insulating blocks forming the lower courses of the internal leaf of the wall, specifically where the wall crosses the insulation. Although aerated blocks aren’t wonderful insulators, the heat has to pass through at least 250mm of block, which adds up to a useful amount of thermal resistance. An expensive lower conductivity, but thinner “thermal break” element may in fact perform worse than this if the rest of the wall is dense concrete. Many of us are used to living and working in ‘leaky’ buildings that rely on uncontrolled ventilation to ensure good indoor air quality. Once these leaks are reduced with good air tightness, fresh air needs to be supplied and stale air extracted, in a controlled manner. A mechanical ventilation system with heat recovery (MVHR) can transfer heat from the stale outgoing air to the fresh incoming air, therefore making the building much more energy efficient. A system that is well designed installed and maintained, and understood by the users, can bring enormous benefits in terms of air quality and energy efficiency. MVHR is therefore a requirement for Passivhaus buildings. A well-designed Passivhaus MVHR system will be clear and simple, with controls and maintenance access conveniently located and easy to operate, plus it will be installed correctly; this will deliver a high quality ventilation system that will run efficiently, quietly, and deliver clean fresh air as needed. The importance of heat recovery efficiency in the PHPP energy model means that high quality Passivhaus certified components are justified, and the expense can be offset against additional fabric insulation costs that a poorer MVHR would require. 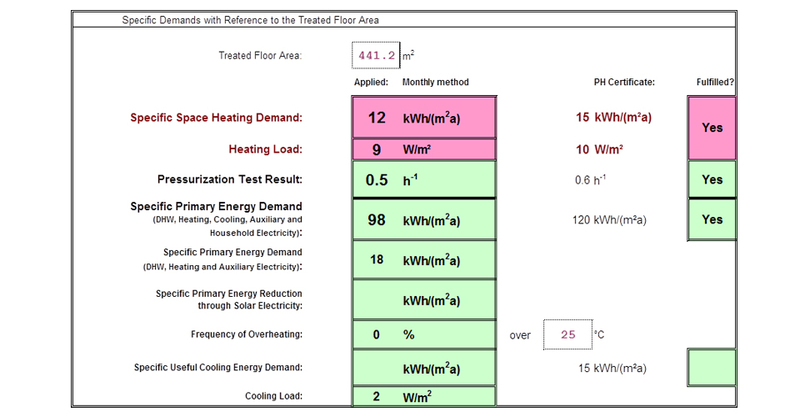 The performance of the ventilation system is considered an integral element of the primary Passivhaus heating demand calculation, though the rest of the services are not. The impetus for using MVHR may have come from the opportunity for heat recovery but now we recognise that the main benefit of these ventilation systems is basically good ventilation. The Passivhaus standard sets detailed criteria for airflow rates, noise levels and commissioning which, if followed, will lead to ventilation that works well and provided high levels of building user comfort. If you have any further questions on ‘Why Choose Passivhau’ click here to down load more information. If you have any further questions on ‘How to Build Passivhaus’ click here to down load more information. Passivhaus explained in 90 seconds from Hans-Jörn Eich on Vimeo. In addition to working to the Passivhaus standard which predominantly looks at energy saving design to reduce the carbon foot print while maintaining high comfort levels, our work in environmental ecological design ranges from ‘light’ green to ‘deep’ green / depending on our clients’ requirements and the opportunities of any given site. Past projects have included clients who want to include nominal environmental considerations within their design who are owners of historic / listed or traditional buildings who want to renovate or extend with natural healthy breathing materials and improve standards as far as is reasonable. In these cases we would look to work to the Passivhaus EnerPHit retrofit standard wherever possible subject to Listed Building Consent approval or other site and briefing constraints. Buildings that have been refurbished using Passivhaus components can be certified to the EnerPHit standard as evidence of quality assurance and to verify achievement of the specific energy values. Past projects have included fully autonomous community buildings and private eco houses with no external utility services, sustained from renewable energy generated on site. These super insulated, low energy buildings provide all their own power from sun and wind using a range of renewable energies including photovoltaics, heat pumps, solar thermal, wind turbines and hydropower. They collect and recycle their own rainwater and treat their own sewage wastes biologically on site. The buildings are generally contain no toxins, formaldehyde or other volatile solvents to create a healthy natural internal environment. Minimal heat loss ,super insulation, triple glazing, compact built form and thermal mass. Solar shading in summer to prevent overheating, along with night time purge ventilation. On site renewable energy production – solar photovoltaic array, solar thermal panels, hydropower, wind power, ground source heat pumps, air source heat pumps and bio mass boiler systems. Low energy lighting design and low energy A* domestic rated appliances through out. Non-chemical, biological onsite sewage treatment systems, reed bed systems, leach fields or composting toilets depending the site conditions. FSC certified timber from sustainably managed forests, UK locally grown where possible. Non-toxic solvent free, material & natural organic paints and stains internally and externally. Locally sourced recycled materials or reclaimed materials rather than virgin sourced materials. Landscaping to support the local flora & fauna – Bio diverse natural sedum roofs promoting local wildlife. Eco Arc has retained a commitment to social justice actively seeking opportunities to provide sustainable architecture to all sections of society and particularly for the socially or economically disadvantaged. We have initiated projects for ‘urban regeneration’ in deprived inner city areas, set up ‘community self build housing projects’ and community skills training projects for homeless people, Ex-offenders (recently released from prison) and long term unemployed people. 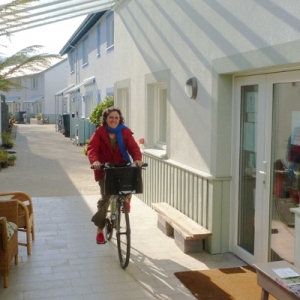 Our interest in including social and economic considerations within the pre design, design and procurement processes has led to a series low cost, low energy sustainable social housing projects and community development work with regional regeneration partnerships. Eco Arc has made a conscious effort to provide sustainable development through participatory design for projects involving people with special needs whether that be mental or physical disabilities in the local community. Such projects include a MIND Complimentary Health Centre at Prestwich Metal Health Hospital, A training and Resource Education Centre for people with special needs at Heeley City Farm and a MIND Craft Workshop for people with special needs in Wakefield. Eco Arc have been involved in a series of community based, skills training, employment youth projects employing, mostly previously unemployed people, on a range of environmentally based enterprises. Money raised locally was used to lever out support from UK funding agents, the European Regional Development Fund and Single Regeneration Budget amongst others. Environmental and financial sustainability can come together if our commitment to meeting the needs of deprived communities and excluded individuals are balanced with a sound business model that recognises the value of being green. Eco Arc’s sustainable building designs for community projects have very low running costs and are healthier and cheaper to run for clients who often have very limited revenue funding for day to day expenses. Feasibility Studies, Environmental Design Studies and Business Plans. Covering outline sketch design proposals, land appraisal, funding / organisational option plans and business plans with cost estimates. Full RIBA RIAS Architect Design Services. Including an integrated sustainable Passivhaus design approach creating healthy efficient buildings, aiming for a sustainable low carbon future, from initial planning designs through to completion on site. Project Management for Community Projects, Community Training and Self Build Initiatives. Including community participation and liaison, full business / project plans, revenue and capital fund-raising, site appraisals and co-ordination of project implementation. If you are thinking of a new eco design, Passivhaus or EnerPHit retrofit project, please do get in touch via the CONTACTS PAGE . We can take you through the design, planning and construction stages of creating a really beautiful, low energy and comfortable healthy building. If you have any further questions click the images below to download the publications.